Today was an earlier start ( and even earlier if you want to beat the young crowd that has just checked into the hotel so that one can post a blog!…apparently they are from the University of Miami on a study term). Breakfast was at 7, with an 8 am departure. We boarded a bus that took us to the drop off point to see 1 of the 5 volcanic caldera’s, Sierra Negra. This caldera is reportedly the second largest in the world with a diameter of over 10 Km. We made our rest stop at the ranger’s station and then began our hike. It was misty and cool so we all donned our rain gear. But within 15 minutes we had travelled out of the influence of the westerly winds dumping mist on the west side of the mountain…. Time to get out of that gear and get prepared for a very sunny walk. Within about 45 minutes we reached the caldera. A magnificent sight indeed! After we had regrouped we walked further northeast. 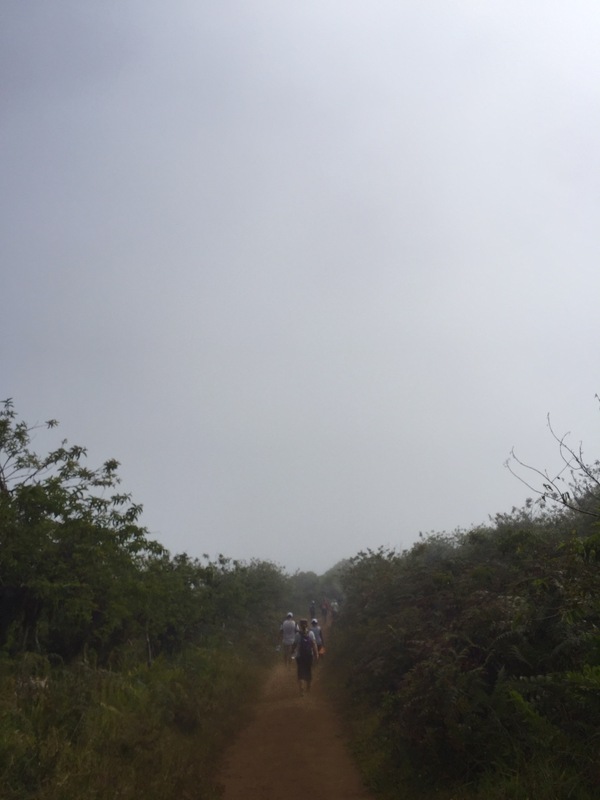 The walking path was very easy, slightly up hill and very very dusty. Another 45 minutes of easy climbing took us to a very shaded spot. Here some of us left gear with our secondary guide so that we could lighten our load for the more challenging walk. Our intention was to return to this spot for lunch. 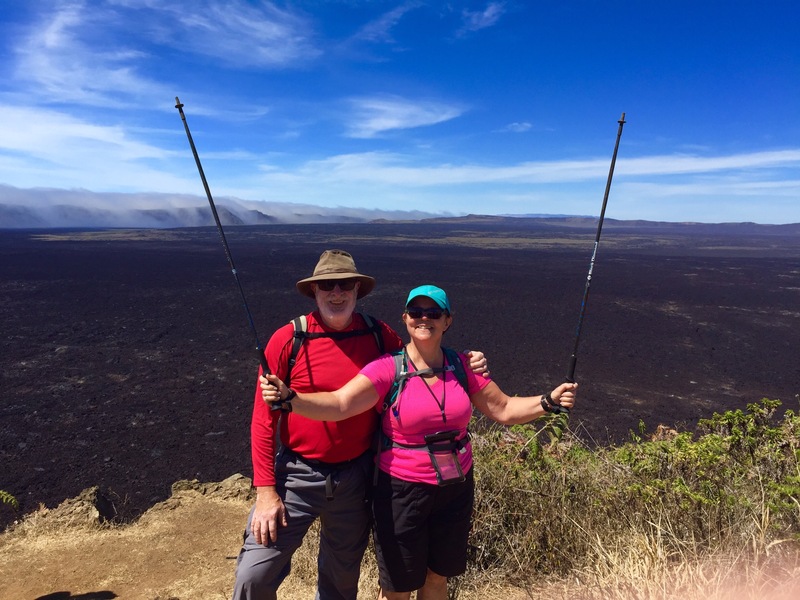 Wilson gave us a choice of an easier walk that would traverse the rim of the crater, and give us a view of the valley, or we could walk down into the lava fields and get another spectacular view from there. 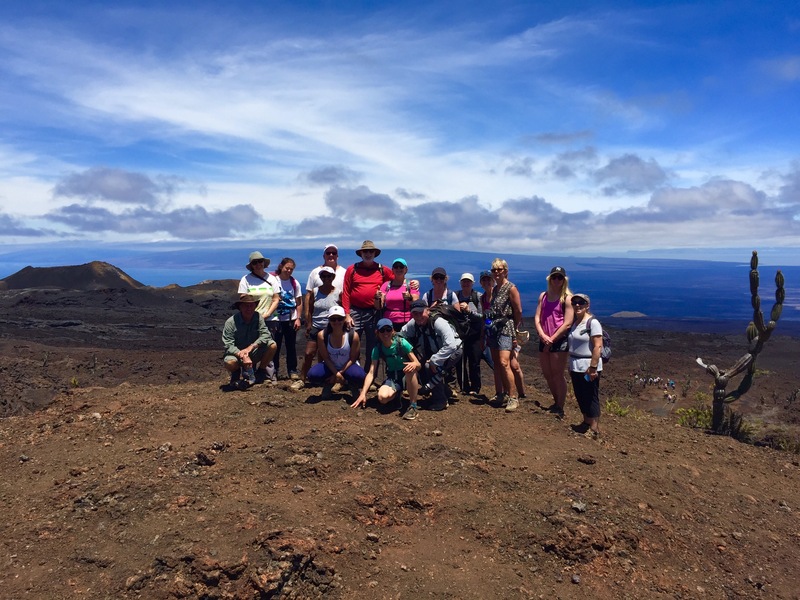 The group was unanimous in choosing the more difficult route – the lava fields. This route took us across “aa lava” ( so named by the Hawaiians because when you walk across it with bare feet you said “ah ah”). This lava is a very broken and crumbled looking lava, very similar to the flow remains that we saw yesterday….only much more extensive. This volcano is still active with its last eruption being 2005! Above you can see a lava tunnel. We saw an number of lava caves, and the remnants of the 1978 and 2005 eruptions. Very interesting to see the black flows in amongst the oxidized red surfaces of previous eruptions. 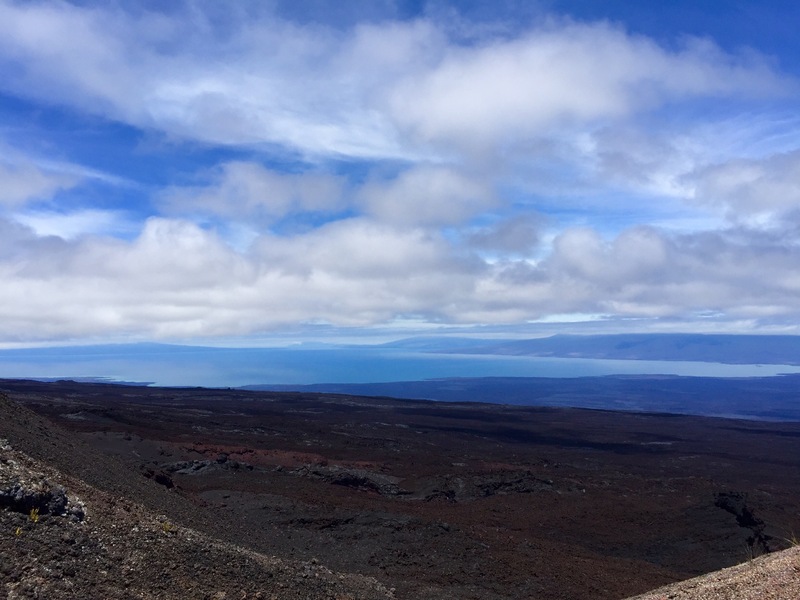 Our last venture was around some large lava sink holes to a lookout that let us see islands to the east and west of Isabela and the northern tip of this island. Absolutely spectacular! 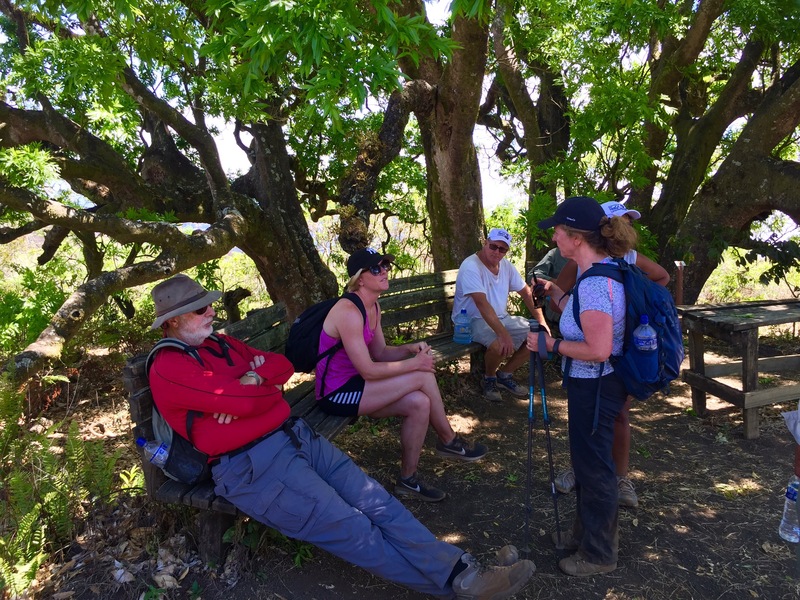 We headed back after our amazing journey to the tree where Andrea awaited with some of the deposited backpacks. Time for lunch sitting in some much needed shade! 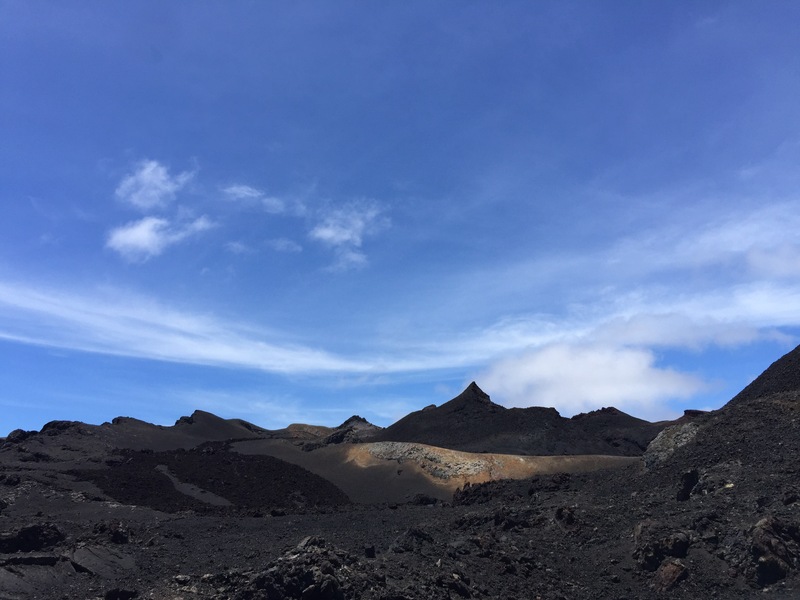 The temperature change was amazing and so refreshing after walking across black lava rock in the noon heat of the equatorial sun. After a satisfying lunch we headed back to the ranger’s station. About 2 Km from the station we walked into a cloud of refreshing mist that stayed with us until we got to the village. 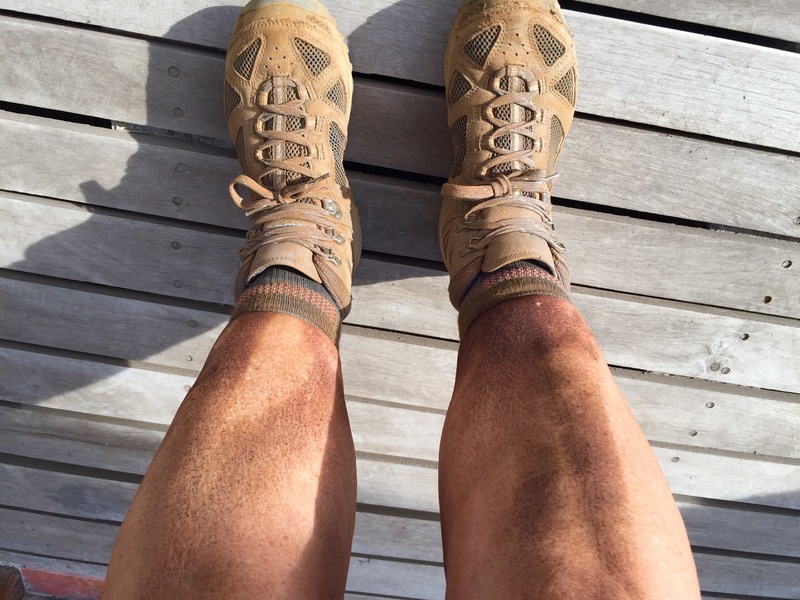 I was coated in dust and certainly ready for a shower! As were all of us! But what a trek! After our ablutions we met Gwen and Glenn and went off in search of a pitcher of Sangria. We had been advised by our local guide Andrea that the Booby Trap would be the place to go. We walked along the beach watching the setting sun, and found the place. Upstairs we sat at the coolest table (cross section of a large tree) and ordered some Sangria. The bartender walked over and said he didn’t know what it was, but if we told him what to do, he could make it. We gave him the ingredients, and he conjured up a wonderful facsimile using Guava juice instead of lime juice…. It was a dry rendition, but delicious none the less! After a pitcher of Sangria while watching a stunning sunset, we didn’t want to leave. 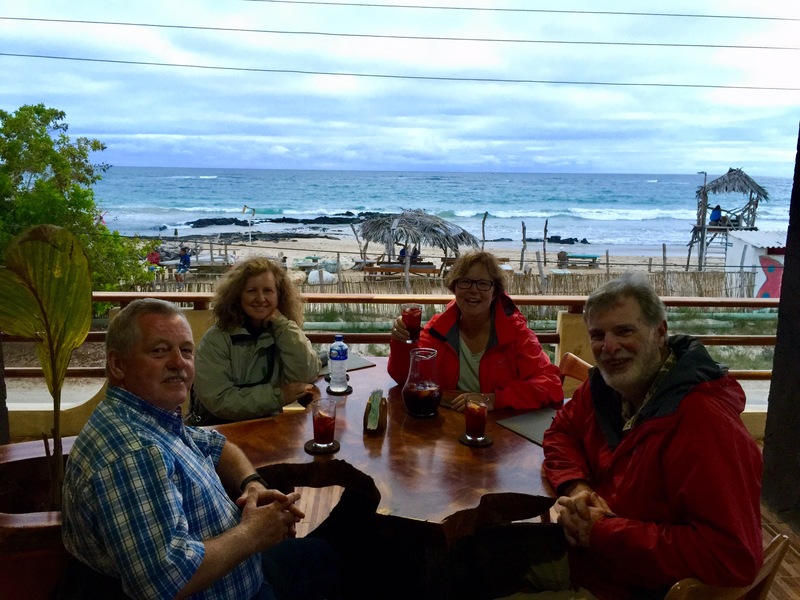 So we stayed and ordered our dinner, and to a person it was the best meal that we have had since coming to the Galapagos, and that’s saying a lot! Tired, bellies full, we headed back to our hotel. It would be an early night after our 16km hike plus our around town walking. 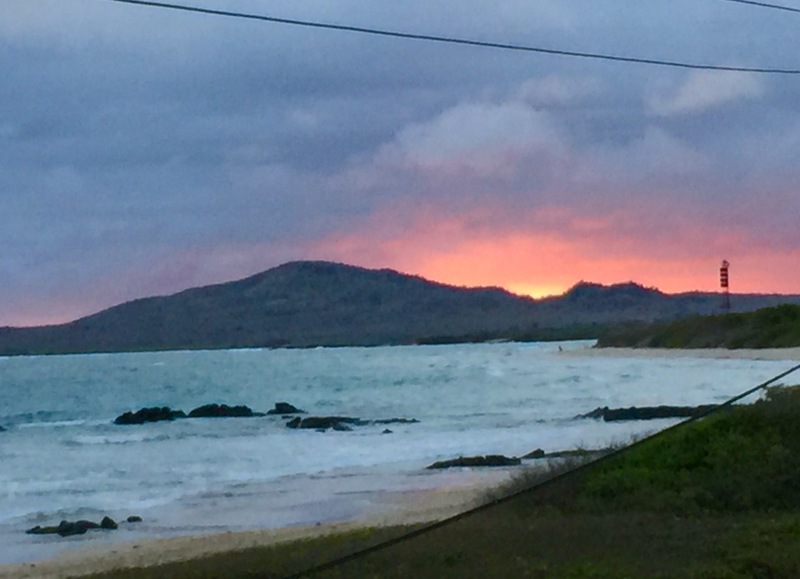 Tomorrow is our earliest start yet as we must embark for Santa Cruz Island …the last island in our stays in the Galapagos. We are promised a full day and should make this an early night, so once again I bid you all Buenas Noches! Beautiful pics as always, and love your literary skills in describing your adventures!! You are all looking happy and fabulous! I love reading about your adventures. I was wondering how your ankle fared in those lava fields. I hope tomorrow is as wonderful as this. Ankle, feet and legs are all fine! We are all doing well so far! !